How much would it cost to develop Chatbot System for taxi booking platform? Business Insider reports that over 80% businesses are expected to have Chatbot automation implemented by 2020, given its efficiency and versatility. With every single day passing out, something very exciting and enchanting is happening in the world of technology. Chatbots development and its implementation are advancing at a greater pace than expected and helping businesses to reach to their full potential. Who doesn’t know Chatbot today? It is Artificial Intelligence (AI) powered computer program that has been invented to replace human conversation. Using AI, NLP and Machine Learning, custom Chatbot development in the form of Flow-based bots, Conversational Bots and Virtual assistant bots can be developed to deliver other key services of several business areas. Why Chatbot Development is a must for Taxi Booking Business? Chatbot certainly is the Next Big Thing that can offer several benefits and insights which will add value to a taxi booking business. Chatbot development will provide exact data that will help in determining how customers users your taxi booking app and what they feel. AI powered Chatbots can also perform actions if programed to do so. Chatbot gives unique interactive experiences on major platforms increasing chances of high retention rate. Bots will deliver better and seamless ‘Customer Service’, be it urgent information or solution to a problem. It is a feeling of having a 24/7 support system available when needed. What Let’s Nurture offers for Chatbot Development for Taxi Booking Business? Hire Chatbot developers from Let’s Nurture who are experts in developing intelligent chatbot solutions being well versed with NLP, AI and Machine Learning technologies. 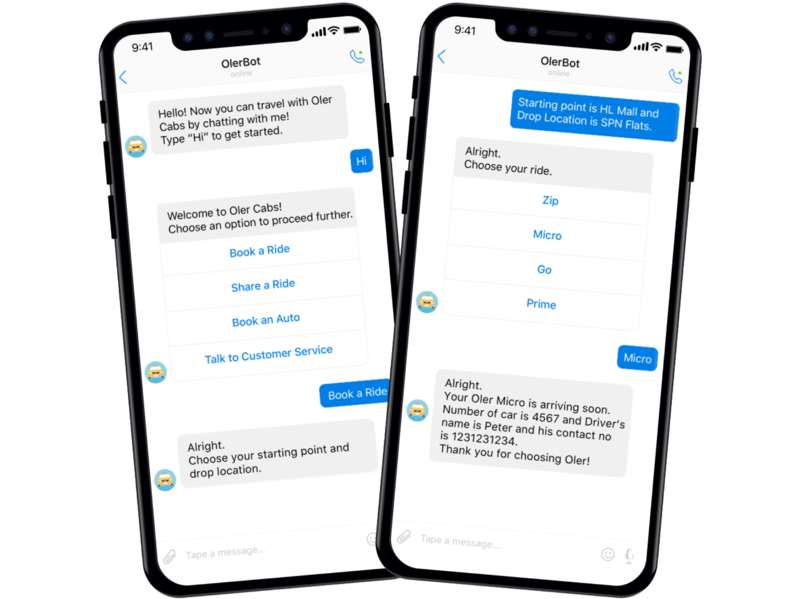 Chatbot developers are experienced in working with SMS API, Google Geocoding API, API.AI, NLP engine and more to create a seamless conversational ride booking application along with best-in-class Chatbot interface. NLP is a computer algorithm which is used to converse with and mimic human conversations. We do not believe that a web API is the solution for every problem. Http calls can be slow. Libraries, on the other hand, are hackable. We have used a supervised learning model with some pre-loaded data to extract features and build a Machine Learning model against the training set. Want to develop Custom Chat bot for a Taxi booking platform? If you are the owner of an on demand taxi booking marketplace platform like Uber, Lyft or Gett; then there you already are aware about the importance of bringing innovations to your business products to stay in the competition. Chat bot is destined to simplify taxi or cab booking option that will help in transforming customer service for your taxi platform. Chatbot development and implementation will not only adds value to your taxi booking app but also enhances the overall functionality by enhancing UX. To gain maximum benefits, it is always the best move to consult with the Chatbot experts who can be catalyst in making your dreams turn to reality. Let’s Nurture is an ISO 9001:2015 Certified leading Chatbot Development Company in India, USA, UK, Canada and Australia. Empowered with AI, NLP, and Machine Learning technologies, we, at Let’s Nurture, offer complete Chatbot solutions for Facebook, Twitter, Slack, Kik, Skype and much more leveraging Custom Chatbot development. The estimated cost of developing Chatbot for taxi booking marketplace platform will be in the region of $3.5k-5k. Let us have a look at the features users will be able to avail through Chatbot development in a taxi booking app. 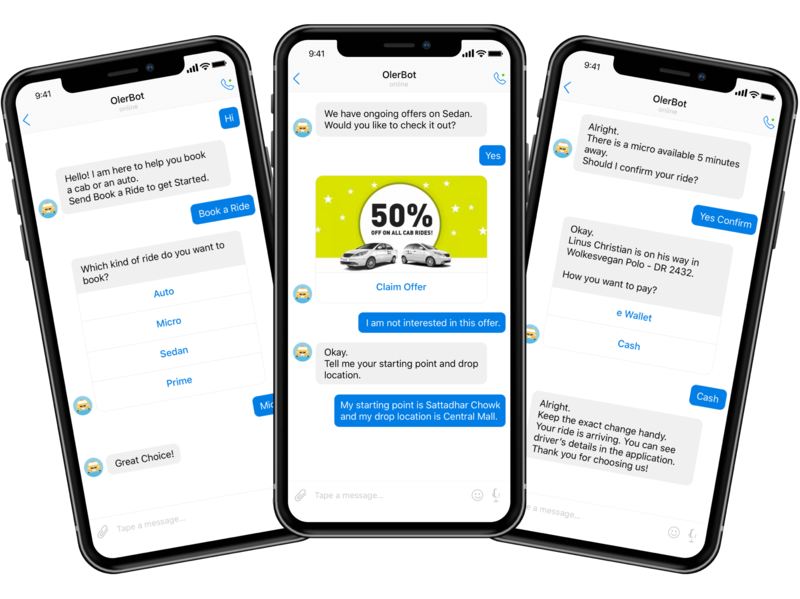 Facebook Messenger Chat bot, is the ideal example of how to enhance taxi business, even without having to download the taxi booking app to avail the services. 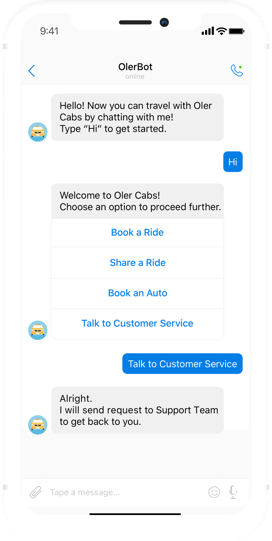 All the passengers need to do is to customize their Facebook Messenger to suit services and all FB users can book a cab by chatting with the Messenger bot. Chat bots have potential to offer an unparalleled way of delivery user experience with much of a delight. Instead of having to download and Sign Up for an additional dedicated app to access a new service, mobile messaging users will simply send a text to bot of their choice to book a ride. Other services such as appointment booking, ticket booking services etc can also be availed by users. Can I integrate Chatbot with existing cab/ taxi booking app? Can Chatbots automatically learn questions asked by users of cab/ taxi booking app? It is not mandatory to host the Chatbot on a separate server. We can develop and integrate the Chatbot to the same server that runs web or mobile app for cab/ taxi booking app. Which type of Chatbot should be integrated with cab/ taxi booking application? Converational and flow based Chatbots can be built and integrated with cab/ taxi booking app platform. Is there any facility to export the chat happened between bots and users for cab booking platform? Can you provide option to hire dedicated Chatbot developers for my cab/ taxi booking app? Have an !dea to develop Chabot for a taxi booking Submit your queries below.